All Acratech ballheads are constructed from precision made, high grade, aircraft aluminium, which accounts for their strength and extremely light weight. The GV2 weighs in at less than 1 lb (.45kg) including a quick release plate. This is less than half the weight of some of the most popular conventional ballheads. 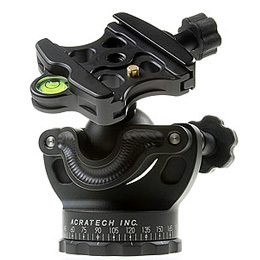 Acratech heads take the widely used Arca-swiss compatible quick-release plates, which I much prefer, as opposed to the myriad of heavy, clunky designs served up from the likes of Manfrotto and a few others. You can purchase a specific Acratech plate to match your camera model, but any Arca-swiss compatible plate will fit and I’ve used many. You can also opt for different quick release clamps (1) on top of the ballhead; I selected one with a level and detent pin to pevent your camera sliding off if you forget to fully tighten your Quick Release knob. For those that prefer, you can opt for a lever as opposed to the screw type knob, however the latter works well for me. The ball is held fast by within ball clamp (4) which is lined with a thin, black, nylon (?) bushing; you can just make this out in Ultimate II ballhead diagram above. Being exposed, I worried about the bushing becoming gradually damaged by dirt and wear but there is no indication of any degradation in over 3 years of use. There are two tightening controls on the ball, the Ball Locking knob (7), and the much smaller Ball Tension knob (8). Both are rubber covered for an easier grip, which is particularly important when using in cold weather. These work just like the controls on pretty much all ballheads. The Ball Tension knob (8) adjusts the amount of friction on the ball for your particular camera and lens combination. Ideally this should be adjusted to enable you to move the camera with Ball Lock knob (7) still untightened, but without it flopping down. I invariably forget to set this correctly but it’s never far out. Once set you then simply level your camera and lock in position by tightening the Ball Lock knob. One review I read described a small right hand movement when tightening the Ball Lock knob, but I have never experienced any movement. The head locks very solid indeed. Being an open design of course, you have much more freedom of movement and additional positional ability with the Acratech GC2 ballhead. I find when I switch to a conventional ballhead now I find them quite restrictive. For me this is another big plus to the Acratech design. Acratech also advertise that the GV2 can be used as a gimbal head. This seemed quite appealing at the time as I frequently used a 100-400mm zoom for shooting wildlife, and was also considering purchasing a EF 300m f/2.8 and converters. Gimbal heads, as you probably know are large, clumsy and very expensive, so the GV2 appeared to offer a financially sound proposition. To use as a gimbal, you simply drop the Ball Stem (6) into the Drop-notch (5) and leave the Ball Lock Knob (7) untightened. Acratech describe this feature as being unique to them, but all ballheads have an equivalent drop-notch or slot, so could equally be used in this fashion. However, when trying this on other ballheads the Acratech GV2 does seem to handle this much better somehow. The Gimbal feature is not something I’d care risk using a long heavy lens such as a 500mm though, but with my 5D mark-III and the EF 100-400mm f/4.5-5.6 (totalling around 5.2 lbs/2.6kg) on a sturdy Gitzo 3541LS tripod, it works very well. If you’re a little confused over my explanations of how the GV2 operates, then it may be best to watch the instructional video below from Acratech. It’s a bit of a dry, rather unglamorous presentation (take note Acratech), but you’ll perhaps better understand the functionality when viewed. The GV2, like all the Acratech gear, sports a hard, black satin, anodized finish. The base has a panning scale in dual-degree markings which are laser engraved and easy to read. When pristine the GV2 looks pretty good and rather high tech too. Unfortunately I’m often a bit of a klutz with my gear, so my tripod (with the GV2 attached) frequently gets unceremoniously dumped on muddy ground, chucked into the boot of my car, or dropped on a sandy beach, and has never been mollycoddled or had the luxury of a fancy head-sock. It frequently gets exposed to adverse weather conditions here in the UK, whether that be the seemingly ever present Scottish rain, salt spray at the Yorkshire coast, or just damp November mists, it seems to cope just fine. It’s also survived trips to Iceland and Antarctica. A simple wipe down is normally the only servicing the GV2 requires. The head has received the odd knock and scrape for sure, so there is the odd scratch and ding, but considering the ill treatment it receives by me it still looks pretty darn good. So top marks to Acratech’s anodized finish. Despite the precision engineering I did experience an odd failure last year whilst in Iceland. I suspect (although can’t be sure), that excessively damp and cold conditions may have contributed to this, although to be fair, it had been through similar conditions in Scotland. The main Ball Lock knob ceased shut in the fully tightened position. Initially it couldn’t be turned either way, but eventually it came free and managed to rotate the knob anticlockwise. However, the whole Ball Lock knob backed out of the thread and completely unscrewed from the spindle. I could screw it back on OK, but the ball remained fully clamped regardless of what position the knob was in. Luckily I could still unclamp and clamp the ball using just the Tension knob (8) alone, but this is small and rather fiddly to use especially in the cold. However, I got by like this for the remaining few days of my trip. My GV2 was purchased from Bob Rigby Photographic Ltd, who are the main Acratech dealer here in the UK. I contacted them upon my return and was delighted to be informed that all Acratech products are guaranteed for 10 years. I simply had to return the GV2 to them for repair, my only expense being the postage both ways. In little over a week my GV2 was repaired, returned and as good as new. I was pretty impressed. Although it appeared some parts were replaced, no explanation was given for the failure. So far I’ve had no recurrence of the problem and the GV2 has performed flawlessly since. I can’t fault the service from Bob Rigby and the 10 year guarantee is worthy of much consideration if you are in the market for a ballhead. It’s a pity all photographic equipment isn’t similarly guaranteed. Below are a few shots of the GV2 taken in my back garden, with and without the levelling base and camera. The Camera is a Canon EOS 5D mark-III, but it may look a little odd as it’s sporting a silicone skin covering. The tripod is a Gitzo GT3541LS Systematic. So Would I Recomend the GV2 Ballhead? Despite the unfortunate failure, the answer still has to be in the affirmative. The repair service was excellent, and with that guarantee you don’t have to worry for 10 years. Feedback from Bob Rigby indicated that failures with Arcatech gear are pretty rare, and you can’t help but be impressed by Acratech’s engineering and quality finish. The GV2 can take a bit of getting used to though; it’s rather different, and the knobs can seem a bit fiddly at times, especially when combined with the Acratech levelling base which I also use. However, if you want a compact, versatile, and extremely capable, light weight ballhead, then the GV2 has to be near the top of everyone’s list. It’s not cheap though but then quality items never are, but priced at slightly over £300 in the UK puts it not far short of the Arca Swiss Z1, or Kirk BH-1 so it faces some very stiff competition indeed. For me though that extra bit of versatility and the light weight win me over and I’m pretty sure my GV2 will see many more years of use yet. Hi John. Excellent photography, as well as your review of the Acratech GV2 Ballhead. I am considering the Acratech Ultimate (or Ultimate II) for my small Nikon D5300 (and no lenses larger than a Sigma 105mm f/2.8 EX OS HSM Macro lens). I take it you recommend Acratech, despite that one failure you experienced. Thank you sir. Any of the Acratech heads you suggested will be just fine for your camera and lens combination, and will also serve you well should you choose to use a larger camera body and longer lenses in the future. It’s quality gear, but their lifetime guarantee will also put your mind at rest. Thanks, I really enjoyed reading your article and it will surely help me out throughout this ballhead universe as I need to buy one!